Deep Sea Fishing – Rainbow Foods (Pvt) Ltd – Exporting Tuna & Other Sea Food Products World Wide. 70/5 Allen Avenue, Dehiwala, Sri Lanka. 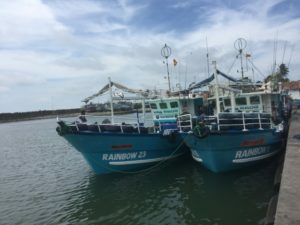 We are proud to announce that, we owns 04 multiday fishing Boats, which are fully equipped with the modern technology to catch tuna and including VMS’s (Vessel Monitoring System) all of them are registered with the Ministry of Fisheries and as well as with Indian Ocean Tuna Commission (IOTC). Rainbow Foods (Pvt) Ltd is one of the companies of Rainbow Group which consist of Rainbow Sane Chem Ceylon (Pvt) Ltd.